What a wild weekend in the hockey world! Well, a tad bit underwhelming in terms of trades heading into the roster freeze on Saturday, but certainly enough to talk about after the protected lists were released. I’m going to spare you my opinion since there’s plenty to get to in this week’s Blades update. First off, a big Happy Father’s Day to all the Dads out there! 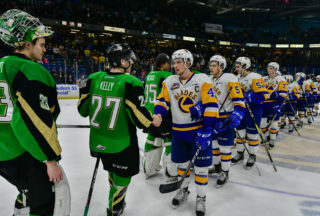 Victor Findlay, a Canadian University Sports Network hockey insider, reported on Saturday Blades graduating forward and Saskatoon product, Jesse Shynkaruk has a deal with the U of S Huskies for the upcoming season. While there is interest from both parties, Shynkaruk says nothing has been confirmed yet. The Huskies told him there are two roster spots they are looking to fill and he is one of three players in contention. “As far as I know I’m going to have to battle for a spot,” said Shynkaruk on Saturday. Shynkaruk played a total of 254 career games in the WHL, finishing his career in his hometown with the Blades where he was a fan favourite scoring 31 goals in 58 games, including 10 game winners. Hockey Canada is expected to announce camp invite lists in the coming days for the U17 and U18 National teams. The U18 team would be the first to compete at the Ivan Hlinka Memorial Tournament which goes in August. The U17’s take place in late October and into November, while the World U18 Championships aren’t until next Spring. 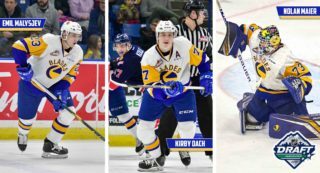 With a strong nucleus of young talent, Blades fans may want to keep an eye out for this release. Keeping in mind 16 year old netminder Nolan Maier was one of 16 goalies in the country invited to Hockey Canada’s Program of Excellence Camp last weekend; 17 year old Chase Wouters brought home a Silver Medal at the U17’s in November of 2016. I’m sure you’ve heard rumblings or rumours about the lawsuit being filed against the CHL/WHL. 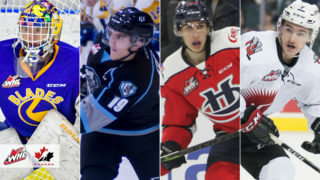 Last week a Calgary judge gave the go ahead to proceed to trial with the lawsuit against the WHL and their Canadian member teams. I’m not going to dive into detail too much, but to sum things up the lawsuit wants WHL teams to pay their players minimum wage, overtime, holiday pay, etc. You can read WHL Commissioner Ron Robison’s statement here. And if you’re curious about the man behind the lawsuit, CBC interviewed him and another CHL alumnus; each with opposing views on the situation. Watch the full feature by clicking here. Last week the WHL released the 2017 pre-season schedule. 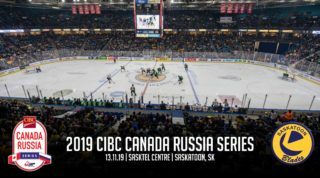 The Saskatoon Blades have 6 games on the docket including 3 against the Prince Albert Raiders, one against the Regina Pats and Swift Current Broncos, and one versus the Edmonton Oil Kings. 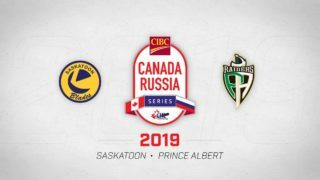 Five of the six contests will be played on the road, but Blades fans will get a chance to see some of the potential players on Saturday, September 9th, in a home away from home game at the Legends Centre in Warman, SK. The 2017 Season Seat renewal deadline has passed. Which means all seats for the upcoming season that aren’t purchased are now open to the public. A great opportunity if you’re considering season tickets as plenty of great seats are now up for grabs! For more info on season tickets, click here. The 2017 NHL Entry Draft is set for the end of this week with the first round getting underway at 5:00pm on Friday from the United Centre in Chicago. Rounds 2-7 will resume at 8:00am on Saturday morning. Mark Rubinchik (140th) and Josh Paterson (205th) were among the NHL central scouting final rankings. We’ll keep you up to date if and when any of our boys are selected. Last week, Darren Zary of the Saskatoon Star Phoenix spoke with Rubinchik to get his thoughts on the upcoming draft. You can read Darren’s article here.